Four friends, played by Steve Zahn, Romany Malco, Michael Imperioli and Ben Chaplin, visit old pal Billy Zane in his seemingly idyllic villa in Belize. But what has Milo (Zane) been up to all these years, and why is there a dead goat in his pool? As things take a turn for the worse in the official trailer for Amazon’s newest dark comedy, there are many questions waiting to be answered, like, how do seemingly quotidian men handle a spiraling situation? And who is behind their misery? And, most importantly, who’s the figure with the cat head? 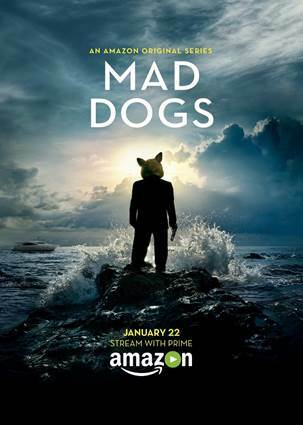 Watch the trailer for the upcoming first season for the hour-long dark comedy “Mad Dogs” by creator Cris Cole, adapted from his hit UK program of the same name. You can currently check out the first episode with your Amazon Prime membership, while the show’s full 10-episode season will be available to stream January 22, 2016. Check out the poster and stills from the series below.